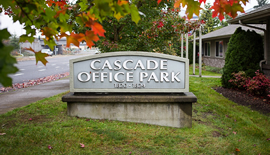 For many years, we have dedicated our clinic to help patients decrease their pain and regain their strength and function. 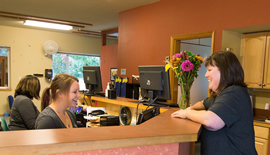 In service to this goal and our patients, we have committed to constant growth, incorporating the latest and most effective approaches to rehabilitation. Here are a few of the core approaches used at Pinnacle Health Solutions to help our patients regain and optimize their health. After an injury or spinal degeneration, pain prevents your body from using your vital and very specific stabilizing muscles called multifidi. Your central nervous system (CNS) then compensates, using other muscles groups to provide some stability. The problem is this – while this compensation helps you get by in the short term, it creates numerous long-term problems as these muscles are not designed for endurance and precise spinal stabilization. As these muscles over-compensate, they eventually fatigue and go into spasm. This ruins your flexibility and can create pain and more injury. 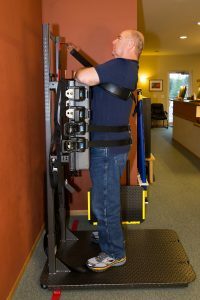 The ATM®2 (Active Therapeutic Movement) utilizes the latest technology to provide pain relief, improve flexibility and strength by switching your vital core muscles back on through active exercise while your body is fully supported in a pain-free position. The ATM2 can improve the health and function of the neck, mid-back, low back, shoulders, hips, knees, and the TMJ. For many patients, the ATM2 can provide fast pain relief and improved function where other traditional methods have failed. Performing exercises in a standing position. Improving endurance and response of the spinal stabilizers. CentriForce TM Bar and Dynamic Force Resistance TM has been shown to effectively and safely achieve these goals. This training system can benefit people of many different abilities – from those who struggle with balance to elite athletes. This system can also dramatically improve spine pain, shoulder problems and posture. 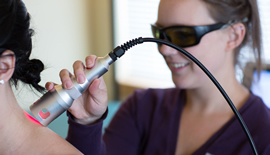 Class IV Laser treatment is a highly concentrated, non-invasive, therapy that has been shown to improve tissue healing, promote circulation and reduce painful inflammation. This highly concentrated form uses much higher wavelength and energy than more common low-level laser therapies such as cold laser. Additionally, we use HealthLightTM therapy, which utilizes LED and infrared light delivery system. Both of these systems are used to successfully treat conditions of the spine and extremity pain, muscle and soft tissue injuries and peripheral neuropathies. Whole Body Vibration (WBV) Therapy utilizes standing platform technology to generate specific vibration frequencies and amplitudes, passing these forces up through the feet into the entire body to decrease joint pain, improve balance and facilitate soft tissue healing. 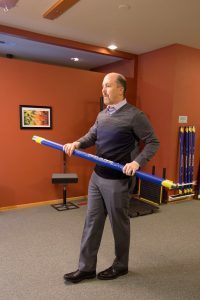 CentriForce TM Bar and Dynamic Force Resistance TM is often combined with Whole Body Vibration to accelerate balance and core strengthening results. Vibration training encourages your muscles to contract over 30 to 40 times every second. This is dramatically different from other types of exercise. Because of this, WBV has been used to improve circulation, treat osteoporosis and improve neuropathies. It has also been used to accelerate healthy weight loss, fat burning and strength gain. Do you want to Learn if our Unique and Comprehensive Approach Can Help You?